00:10:00 Makes 4 servings, 4 pieces (97 g) each. Makes 4 servings, 4 pieces (97 g) each. 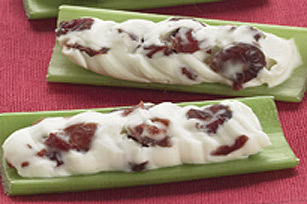 These delicious crunchy stuffed celery bites can help you eat right! Mix cream cheese product and cranberries until well blended. Press into hollow centres of celery. Cut each stalk crosswise into 4 pieces. Substitute raisins or your favourite chopped dried fruit for the cranberries. Prepare as directed. Refrigerate up to 2 days before serving. These crunchy stuffed celery bites can help you eat right! Serving Size Makes 4 servings, 4 pieces (97 g) each.